Sir Arthur MORSE was another of the Irishmen who served as managers of HSBC. 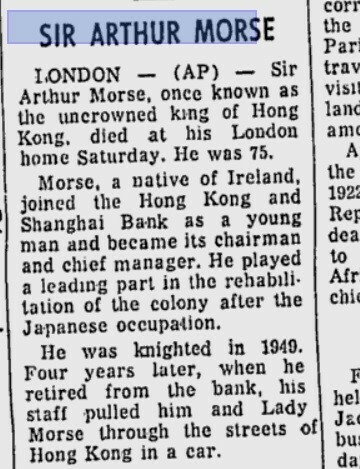 London – (AP) - Sir Arthur Morse, once known as uncrowned king of Hong Kong, died at his London home Saturday. He was 75. Morse, a native of Ireland, joined the Hong Kong and Shanghai Bank as a young man and became its chairman and chief manager. He played a leading part in the rehabilitation of the colony after the Japanese occupation. He was knighted in 1949. Four years later, when he retired from the bank, his staff pulled him and Lady Morse through the streets of Hong Kong in a car. He was born 1892. According to the 1901 Irish Census, his father was Digby Scott MORSE, age 43 (b. abt 1858) born in Co. Kildare, a bank agent. They lived at Mount Bellew Town, Galway, Ireland. Arthur was born in Co. Tipperary. The name “Digby SCOTT” rings bells for me as a name of someone who was in HK in the early days. Need to check this out. There was a General Digby BARKER who was an interim Governor whose daughter Helena married Sir Francis Henry MAY – they has three daughters.